Ceylon cinnamon is rolled like a cigar. Ceylon cinnamon, also called "true cinnamon" is closely associated with Sri Lanka. Ceylon grows just north of Colombo, the island's commercial capital, where there are perfect conditions for growing the revered spice. If you've had cinnamon in the United States, chances are that you are familiar with the cassia variety. The differences between Ceylon and cassia cinnamon may appear subtle at first, but after examining the spices, they become readily apparent. Cassia cinnamon has a dark, reddish-brown color. The spice's sticks are thick and hard, and its inner filling is hollow. The aroma is coarse and the flavors are strong and spicy. The spice is cultivated in Vietnam and China. 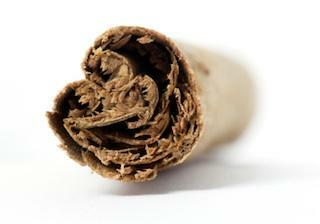 Ceylon cinnamon sticks are light brown and rolled so the inner filling is full, like a roll of parchment paper. The spice's texture is soft; the spice is thin and brittle. Its sweet flavor and delicate aroma are desirable, and it may have hidden health benefits too. The chances of finding true cinnamon in your local grocery store are slim, but you may find the product in specialty stores that sell exotic foods and spices. Many online retailers sell the spice and options are available for people who are apprehensive about buying food and spices online. Penzeys Spices is located in Wauwatosa, Wisconsin and they sell Ceylon cinnamon on their website. The company sells the spice as "softsticks" or ground. Those who prefer ordering from a catalog can request their mail order catalogue. The Spice House has stores in Wisconsin and Illinois, but you may order online or buy a Spice House Catalog. The catalog offers ways to use the spices in addition to product descriptions. Savory Spice Shop, located in Colorado, is an excellent choice because the company grinds its cinnamon in small batches on a weekly basis to ensure optimal freshness. True cinnamon is ideal for pumpkin spice, offering a delicate balance between nutmeg, allspice and ginger. Create an unusual apple pie using the mild spice with a little cayenne pepper for spiciness and color. Citrus undertones add great interest to the traditional dessert. Get inspired with creative chocolate recipes using true cinnamon; artisan Chocolatiers use the spice with ancho and chipotle chilies. Try adding the aromatic spice to your favorite seafood recipe or to cream sauces. Though ideal for puddings, desserts and drink recipes, Ceylon cinnamon can be an excellent complement to dishes with a delicate flavor.